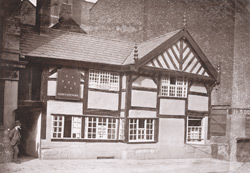 "The 'Seven Stars,' accounted the most ancient hostelry in Manchester, is located in Withy Grove, near the foot of Shudehill. Built at a time when Withy Grove must have been truly a grove of withies, it still retains many of its more ancient features; tradition hovers about the place, and many incidents and events, some true and some imaginary, are related in connection with it. Whether, as has been alleged, it is the oldest licensed house in Great Britain may be doubted, but it has certainly been a house of entertainment for centuries."